Three men have been arrested in the death of 20 year old Krista Dittmeyer. The Maine mom’s body was found in a nearby pond in Conway, NH as her abandonment car was located in the parking lot of the Cranmore Mountain Ski Resort with her baby in the back seat.According to the office of the New Hampshire Attorney General, 28 year-old Anthony Papile, 23 year old Trevor Ferguson of Tamworth and 28 year old Michael Petelis have been arrested in connection with the murder of Krista Dittmeyer. Ferguson and Tamworth were charged with conspiracy to commit robbery, while Papile is accused of suffocating and drowning Dittmeyer. The New Hampshire attorney general’s office said in a statement Wednesday that 28 year-old Anthony Papile, of Ossipee, N.H., has been charged with second degree murder in the death of 20-year-old Krista Dittmeyer. Twenty-three-year-old Trevor Ferguson of Tamworth and 28-year-old Michael Petelis of Ossipee have each been charged with one count of conspiracy to commit robbery. According to court docs, Papile and Petelis discussed arrangements to steal drugs and money from Dittmeyer on April 22. They lured her to their apartment, struck her on the head and then bound her with duct tape and placed her in the trunk of her car. Papile removed Dittmeyer from the trunk of her car and disposed of the bound body in a snowmaking pond at Cranmore Mountain where she was ultimately found. What a shocker, all three of these punks have past criminal records. Ferguson and Petelis are being held on $250,000 cash bail, Papile was denied bail. 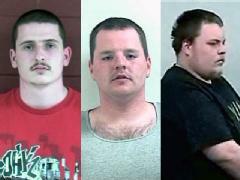 The three dirt bags are being held at Carroll County House of Correction. This makes me sick! A young beautiful mom who made a mistake in getting into the drug scene is robbed and murdered by her “druggie friends”. I am glad to see that the perps have been caught. I think all three of them should be charged with her murder. I am questioning a second degree charge. Maybe this is the result of a plea so they can get them off the street. These 3 look like loser Rednecks from NH. Trevor Ferguason has no criminal record get your facts stright Before you print them !!!!!! !